What the issues of this? I thought it because of my Gdal code that i use to display elevation data, but after i try without the Gdal code it throws the same error. //// gDataset.RasterYSize or you will get a read error. //// it needs to be an array of 1 float. Here is a simple version of your code, I remove the GeoTiff part of it. It looks the sample code run correct, so I think maybe that's related with the data. Could you please test it? And if it also works in your side, a simple sample with test data should be helpful to make sure where is the problem. Or you can try to modify the sample to reproduce it and let us know. 'MapSuiteDependency-NewtonsoftJson' already has a dependency defined for 'Microsoft.CSharp'. it will cause my map become so far and small, need to zoom in and the point is outside the map area, how can i make a plotting point on map. If you want to try how i get the Gdal value from below, it need to add reference gdal Csharp 2.3 with 64 bit platform. Your package is about 1.3 GB, I think that's because you include all the packages in it. Could you please remove the unnecessary dlls from it so I can download it, because my network is a little bad today. And I set the two point is just for simulate your scenario, you can just modfiy it to any point you want. Could you please paste the trace stack of the exception: "System.ArgumentOutOfRangeException: 'The input double value is out of range.'"? If that's thrown from our code, the GDAL is not need, our target is create a simplest sample to recreate your issue, it shouldn't contains any unnecssary code. You can modify based our sample and upload it here (Remove packages, bin and obj folders). I try rendered the raster map on your sample code. I still throw error when i play around with it. It does not show which line that throw the error, only the error message. Why it get error when i try to restore nuget package? I download your sample, it works without problem. 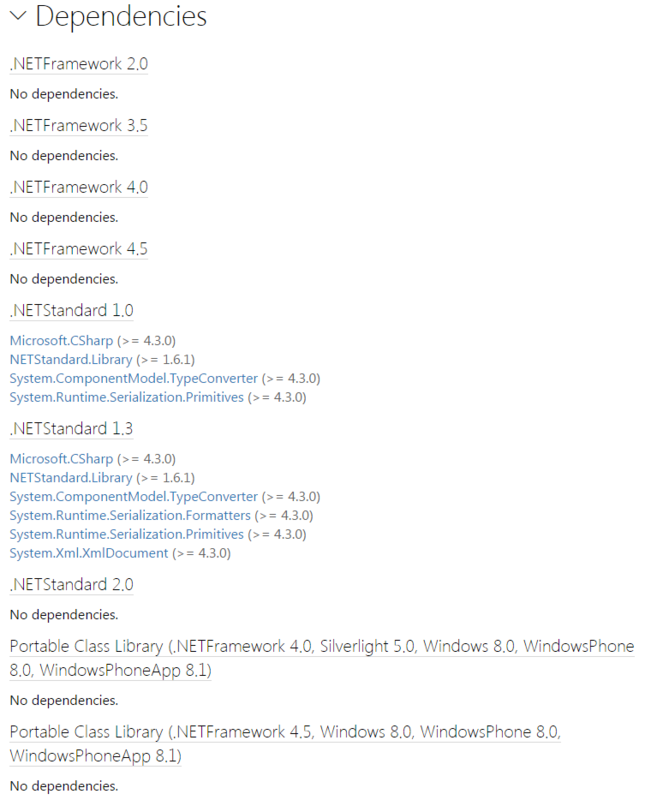 From it's "Dependencies" I think that's maybe related with your .net framework. I think you can try to install higher version .net framework to avoid this problem. And I think you should want to clear your Nuget Cache then get all packages again, or you can install the other packages listed follow your .net framework version.